My friend Anne sent me this idea that I just might have to steal… and thought I would post it so you could steal the idea too. This is my first official reader submission (!) and I would love to do many more, so please send me any cool ideas or examples of projects you’ve done and I’ll show them off on my blog. 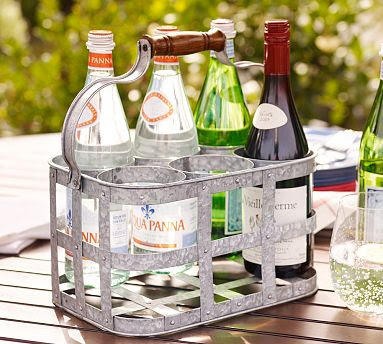 Anne bought this drink caddy from Pottery Barn the other day, with the plan to use it for wine / cool drinks this summer and then convert it into an arts and crafts organizer bin for her daughter afterwards by adding some unbreakable containers and filling them with colored pencils, crayons, scissors, ribbons… you name it. Too cute! I love items that can be repurposed in multiple ways and this is a perfect example. You could also put silverware in there, or have it in a guest bath with different toiletries, or fill it with glass containers of flowers as an interesting vase… the list goes on… Thanks Anne!